Create a personalised appearance for your company. Upload your own company logos, graphics and text which are displayed in the user interface and emails. You can specify a subdomain for free. If you would like to use your own custom domain name please contact your account manager or support@eagle.io. Subdomain changes take effect immediately and logged in users will be prompted to navigate to the new domain. Minimum length of 5 characters is required. The subdomain will be validated on save. Company logos can be uploaded to customize the appearance of the site when accessed via the account domain. Logos are also used in emails sent to users. Click on the logo images to replace them with your own. For best results use images that conform to the recommended dimensions. 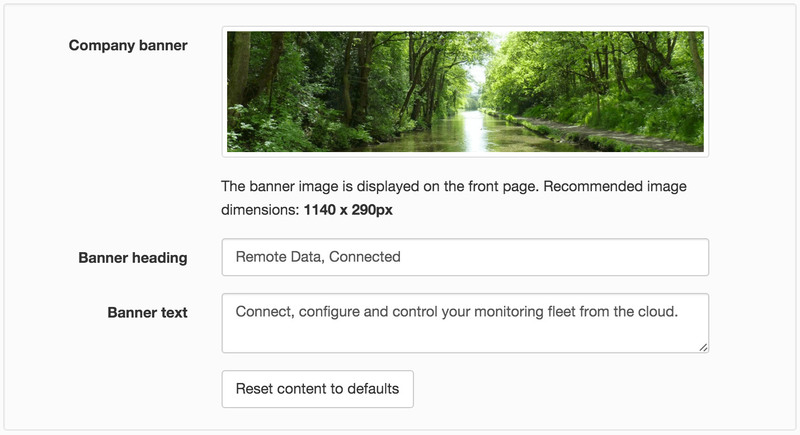 You can customize your landing page by changing the banner image and description. Tick or untick the Contact details checkbox to display or hide your account contact details on the public Contact Us page.